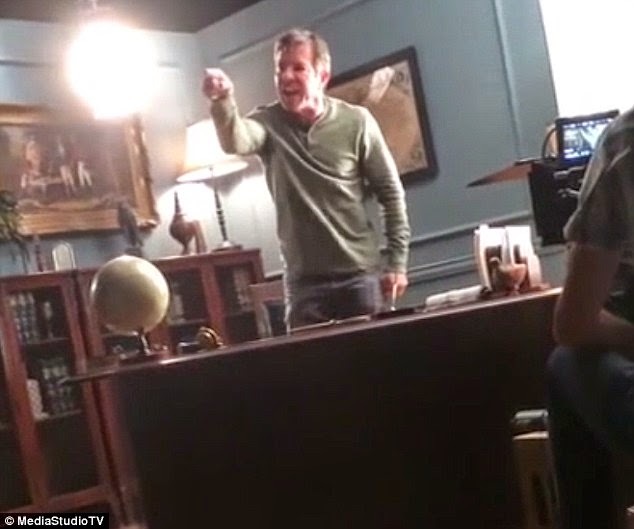 Dennis Quaid really gave us Something to Talk About yesterday. His meltdown moment went viral with everyone on twitter wondering whether it was real or fake. Beats me but I do know there's no question it could have easily been real. Film sets aren't always the party that you stars-in-your-eyes kids wish they were; ask Christian Bale, ask Lily Tomlin, ask George Clooney, ask David O. Russell—come to think of it, do ask David O. Russell! He seems to have some real anger control issues. The reality is film sets are often tense workplaces where the work, while not rocket science or brain surgery, is just as, if not much more, costly. All that money tends to amp up the stakes; it often makes producer-types into edgy, over-zealous micro-managers, directors into control freaks who can't compromise and can't make a decision, and actors, nervous and insecure, and buckling under the pressure of constantly changing demands. Actors melt down but so do directors, producers, assistant directors (not my husband, he's usually the mellow type), the prop guy, the hair and makeup people. It's not new. It's just that now we capture every meltdown moment on camera. That's how it went down with Bud Cort. 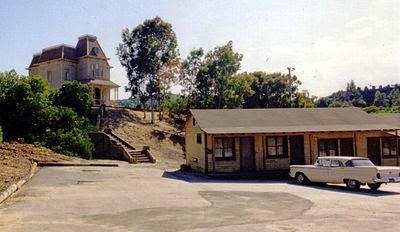 There we were, three or four of us in our street clothes standing outside the Bates Motel exterior set and trying to be unobtrusive while Cort filmed a short scene on the front porch. 'Quiet on the set' is easier said than done when shifting your weight makes the gravel under your feet crunch, or you take just one little inconsequential step to get a better view and there you go clang-banging into the prop cart, the sound exploding in the silence like a gun shot. "Shhh" someone with a walkie glared and suddenly the group had Bud Cort's attention. Not a good thing. We'd heard that Cort, the actor who'd showed such genius in Harold & Maude and Brewster McLoud, was a touch eccentric. The years hadn't quite left the right kind of marks on his boyish face so here it was, almost twenty years later and he looked out of place, no longer a boy, not yet a man. It must have hard to find roles for which he fit the part; part of the reason he hadn't quite lived up to his early promise. Cort called the AD over and they had a short chat, sotto voce; at one point glancing in our direction, the words tour guides making its way back to our little cluster, giving each one of us a reason to find plenty to look at on the ground or in our pocketbooks. "You guys have to be cool or I'm sorry but I'm going to have to ask you to leave." "Should we move?" And we all backed up into a new location. "Going again." The AD called out, the cameras started rolling again as Cort opened his mouth to speak, and just as quickly stopped. What was his problem? We'd hadn't moved a muscle, made a sound. "That's it!" His face was twisted with rage and frustration. "That. Is. It! Get them the f$%k out of my eye-line, goddamn it!" His eye line? That was a new one to me. An actors' eye line is that line of sight where his gaze goes. So you may be out of the camera's sight but not out of his. If he's staring camera left, well goddamn it, you better be standing camera right. We got the f$%k out of his eyeline. Well his brother has had some less-than-sane moments lately. So who knows.